Following a stretch of stripped-down and glum releases, Katatonia hearkens back to its best albums and reinvents them with the dynamic The Fall of Hearts. When Katatonia released Night Is the New Day in 2009, it earned a well-deserved view from the wind-chilled mountaintop. For two decades, the Swedish doom band worked its way to a trilogy of masterful albums: Viva Emptiness (2003), The Great Cold Distance (2006), and Night Is the New Day. Before this, the band was -- and possibly still is -- best known for 1996's Brave Murder Day, a staple in the annals of death doom. For a sophomore album Brave Murder Day shows a rare level of sophistication, and it contains many of the techniques that would later become part of the inimitable Katatonia sonic. Yet while the album is an early peak for the group, it also marks a critical turning point: Opeth mastermind Mikael Akerfeldt performed the "harsh" vocals on the album on account of Katatonia vocalist Jonas Renkse's inability to growl in the malevolent manner necessary for the sounds of Brave Murder Day. Akerfeldt's pipes were on loan only for that LP; beginning with 1998's Discouraged Ones, Renkse's vocal parts are entirely sung, though an occasional scream slips in (see the first chorus of The Great Cold Distance's "Leaders" for a case in point). The absence of death growls, however, is not tantamount to compromising on heaviness. The unfolding of Katatonia's discography since Brave Murder Day has been an entirely natural and punishing evolution, culminating in The Great Cold Distance and Night is the New Day. Renkse's polished vocals are an apt match for the more gothic style of metal Katatonia has exhibited; Brave Murder Day is a cornerstone in the band's sonic, but it is not the blueprint. Tracks like Viva Emptiness's "Evidence" and The Great Cold Distance's "My Twin", with their memorable choruses, blistering riffs, and their melancholy laments are emblematic of the Katatonia that came to a powerful flourish in the '00s. The Great Cold Distance remains one of that decade's superlative metal releases, a gritty and crushing landscape of loss and woe. Following Night is the New Day, Katatonia took an approach that brought it more in alignment with post-2008 Anathema than any groups in the doom fold. Both 2011's Dead End Kings and 2015's Sanctitude reined in the heavier elements of Katatonia's sound, opting to foreground the band's emotional lyrics and overcast soundscapes. Dead End Kings, while not without its moments, is a somewhat limp followup to Night is the New Day, with the group's signature grey taking on an increasingly monochrome palette. Katatonia then put out a companion piece, Dethroned and Uncrowned, which takes Dead End Kings's already muted sonic and strips it down to acoustic arrangements, a trend that extends to Sanctitude, a special one-off concert featuring acoustic versions of key songs from the entire Katatonia catalogue. Of course, these Swedes can't be reduced to heavy riffs and booming choruses, but in sojourning into calmer territory for the five years following Night Is the New Day a good deal of sonic contrast was lost. Katatonia thrives in the transitions from seemingly placid, introspective verses to brutal choruses, and though the former are essential, what make them effective is their juxtaposition with the metallic roar that makes songs like "Evidence" and "Wealth" (both Viva Emptiness tunes) so memorable. Eternal grey skies call for blackened storm clouds once in awhile. As Adrien Begrand quipped, "Katatonia's new 'unplugged' live LP is very nice, but how much more minimal can this band get? One guitar string and triangle?" Fortunately, with The Fall of Hearts, Katatonia's 10th album, the band is no longer working towards a project of reduction. The Fall of Hearts is an expansive and lush intermeshing, bringing together the goth doom of The Great Cold Distance and Night is the New Day with the hushed acoustic style of Dethroned and Uncrowned and Sanctitude. If the latter two records are a case of Katatonia getting too mired in a drab kind of gloominess, they are also necessary for the existence of The Fall of Hearts. In a way, Katatonia's prolonged experiment in stripped-down approaches to its music from Dead End Kings to Sanctitude is a necessary if slightly divergent parallel track of the band's career. Just as the period from Brave Murder Day to Night is the New Day represents the development of a refined approach to heavy music, Sanctitude and its ilk find Katatonia refining the mellow parts of its music. Though the dreariness of Sanctitude and Dethrone and Uncrowned often gives way to indistinguishable shades of misery, hearing the vibrant The Fall of Hearts, it's hard to deny that the past half decade has been an important one for Katatonia. The Fall of Hearts, with its multi-layered songs and distinct tonal and dynamic contrasts, plays like the true followup to Night is the New Day -- though it is critical that without Dead End Kings and its successors, the subdued passages of this new album would not be nearly as excellent as they are here. 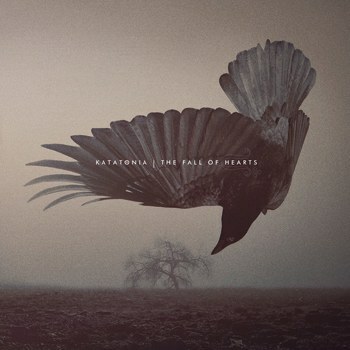 The Fall of Hearts is easily Katatonia's most diverse album in terms of arrangements. By and large, the record consists of songs that run five to seven minutes, with each one shifting from heavy riffs, tense guitar leads, and atmospheric background noise (see the mellotron on "Decima"). Great as The Great Cold Distance and Night is the New Day are, their reliance on verse/chorus structure left plenty of room for The Fall of Hearts to shake things up. Verse and chorus are integral elements here, but they are not so predictably employed. The dazzling opener "Takeover" starts off with clean guitars that wouldn't sound of place on a Killswitch Engage disc, but not long after the guitars take on a melodic doom crunch that brings the song into familiar Katatonia territory. These fluid changes in "Takeover" -- a feature shared with highlight cuts like "Serac" and album centerpiece "Residual" -- are expertly managed by guitarists Anders Nyström and Roger Öjersson, the latter of who, along with drummer Daniel Moilanen, is a new addition to the Katatonia roster. The varied guitar sounds on The Fall of Hearts are one of its greatest successes: the nimble acoustic guitar picking on "Decima" and "Pale Flag" represent a fine continuation of the Chill Katatonia of recent years, while the pick slides and shredding on "Passer" and "Takeover" show a willignness on Nyström and Öjersson's willingness to bring some musical dexterity to the table. At its best, the group's music predominately focuses on atmosphere, but a wailing guitar solo once in awhile provides a nice respite from the walls of brooding distortion that form the basis of many of these songs. There has been much talk of an embrace of prog on Katatonia's part, and not just because the outfit's past few releases have been on the K-Scope label, which is known as the pre-eminent prog label of the day. Thom Jurek of AllMusic argues that the record "adheres more closely to moody, melodic progressive rock,"citing melodies that are "more labyrinthine, less straight-ahead." In his Loudwire review Chad Bowar points to mid-song breaks, such as the one in "Serein", as evidence of an increased prog influence. While the Fall of Hearts tracks are, by and large, more suite-like than anything from the Great Cold Distance period, Katatonia's approach here borrows lightly from rather than gives into progressive rock. Some tonal comparisons can be made between Opeth's guitar tone and Nyström and Öjersson's on this LP, but Katatonia is far less interested in winding through varying levels of a labyrinth in the way Opeth is on records like Ghost Reveries. Perhaps the best example of what Katatonia does on The Fall of Hearts comes on the late album highlight "The Night Subscriber": anchored by a catchy piano melody, the song undergoes several shifts throughout its six minute runtime, yet it remains anchored in the primary melody and a clear chorus. An Opeth song, by contrast, will often start with bellowing death growls, only to end up in wispy acoustic interludes and '70s prog jams. There is a strange kind of unity to some of Opeth's longer suite pieces, but they are primarily defined by their heterogeneity. The Fall of Hearts does take up a comparatively "proggier" approach to song structure than its predecessors, but it is still rooted in the catchiness and accessibility -- owed somewhat to alternative rock and metal -- exemplified in The Great Cold Distance and Night is the New Day. Even when these songs meander, they're rarely too far off the main path. If The Fall of Hearts has one flaw, it is not that its songs come undone in their more complex structures; instead, it's that there's simply too much on the whole. The record runs nearly one hour and ten minutes, and though the music is on the whole some of Katatonia's finest, it sometimes happens that Renkse's cryptic musings become interchangeable. Part of this has to do with Katatonia's music on the whole; there are only so many shades of grey one can explore before they all start to blend together. Wisely, the band ends the album with three of the strongest tunes here -- "The Night Subscriber", "Pale Flag", and "Passer" -- thereby avoiding the problem of a slog to the finish line. The band need not have hacked away at this tracklist of 12 songs to bring it more in line with a standard album length of, say, 50 minutes, but a little trimming would have magnified the already top-notch elements in the LP. Making it through The Fall of Hearts requires no small amount of emotional endurance; in Katatonia's world, beauty exists in a world where the light on the horizon is always dim, shrouded by canopies of charcoal clouds. There's a plausible explanation for why The Fall of Hearts indulges in its own misery for so long: at its best, the album is the first page in an exciting new chapter for Katatonia, a band now in its 25th year. For a group to sound as good as this after ten studio LPs and a quarter of a century is a tremendous thing, and The Fall of Hearts is indeed a tremendous album. Why wouldn't a band want to explore a sonic second wind of this magnitude at some length? Katatonia has been a key purveyor of doom -- the kind that Sweden seems uniquely specialized in -- for a major portion of the genre's existence. By the sound of The Fall of Hearts, these gentlemen will continue wringing heavy music out of despair for a long time to come.